Well, I waited and waited for the Archos, and finally at 5PM, I had to go to the airport, without the new toy. Wouldn't you know, as I was was pulling out of the driveway, there was the UPS truck! I ripped open the package, charged the battery while driving to the airport, and managed to copy some MP3s across on the flight to Atlanta. It plays the music fine. There are so many doo-dads and connectors that ship with it. I've only begun to scratch the surface. In an act that's only symbolic, I copied my Frontier environment to the system. Of course it can't run it. Ryan Tate observes that neither Adobe or Macromedia are involved in The Two-Way Web. It's true. They've had so much time to get on board, it's a wonder that they haven't. Sydney Morning Herald: Podcasts make waves for radio. 10:30PM Eastern: Arrived safely in Atlanta. I'm off to Atlanta tonight, then to Seattle on Wednesday morning, return to Florida on Sunday. It's an exciting trip with lots of cool technology. Most of the meetings are confidential, so I probably won't be able to report much that's specific. I have lots of time on Friday and Saturday to catch up with Seattle friends. Maybe a group dinner? If so, we'll have to do it without Scoble, since he's in San Jose this weekend. Scott Granneman: "I don’t like it when large corporations make wide-ranging decisions for users that disadvantage those that the corporations choose not to favor." Rogers Cadenhead is domain name speculating on the name of the next pope. 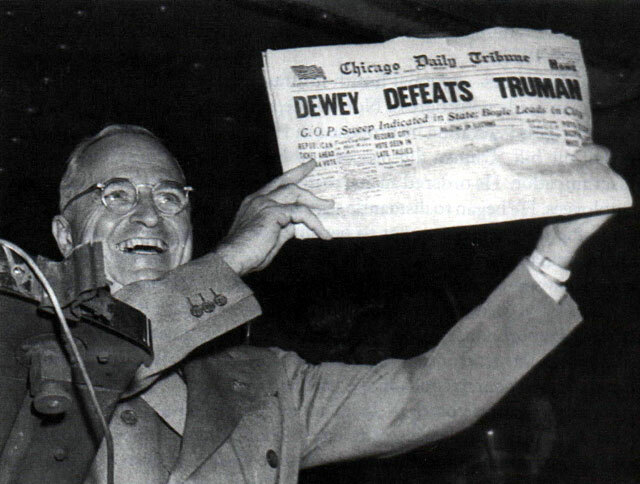 Personally, if by some weird twist of fate they name me the next pope, I will choose the name Pope Harry Truman II. MarketWatch: Adobe Systems to buy Macromedia. $3.4 billion. Off the top of my head, who cares? At one time both companies had some mojo, to borrow a term from Yahoo, but those days are long-gone. Remember all the hooplah over the Allaire-Macromedia acquisition, and all the synergies that were supposed to happen. Hmmm. Did any happen? BusinessWeek didn't think so. Will any happen here? Heh. Slightly more exciting than Microsoft's acquisition of Groove. Phillip Torone has a new podcast, at Make Mag. Four years ago: The Web is a Writing Environment. "Amazingly the print publishers are pulling back from the Web, as if to say 'Whew glad that's over.' Fundamental mistake." Om Malik: "The marketing blitz makes you wonder if this time Intel’s finally figured out how to make a communication chip!" I had lunch with a Republican yesterday, a thoughtful one, and came away with a fair amount more hope than I did going into it. 3AM on the east coast is midnight on the west, 8AM in London. Last update: Monday, April 18, 2005 at 11:22 PM Eastern.